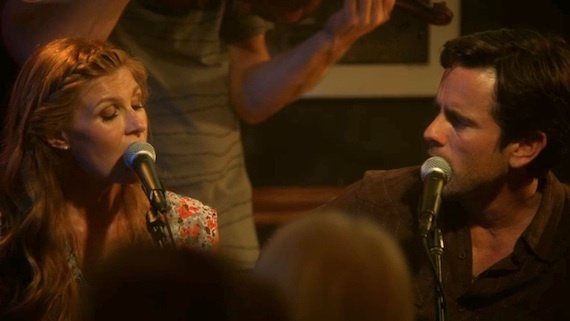 Rayna and Deacon duet on "No One Will Ever Love You." The romance between Juliette and Deacon heated up with the young starlet wooing him to a “songwriting” session that led to skinny dipping. He reminded her, “this is not how songs get written,” but she slyly assured, “no it’s what songs get written about.” They ended up finishing a song, appropriately titled “Undermine,” and actually written by Trent Dabbs and Kacey Musgraves (see video below). Juliette continued to entice Deacon to join her band, telling him that his relationship with Rayna is almost like being married, with all of the hassle and none of the benefits. Juliette then took the fight for Deacon to a whole new level by sending him a gift—a rare 1938 Martin 00-42—to Soundcheck where he was rehearsing with Rayna. Adding to Rayna’s dismay was the taping of Juliette’s music video for “Telescope” on the Music Row roundabout, complete with dancers in front of the Musica statue. “Telescope” is also the first real-life radio single from the series. BMLG is going for adds with Hayden Panettiere’s track on Oct. 29. Cary Barlowe and Hillary Lindsey wrote the song which was produced by Dann Huff for radio and T. Bone Burnett for television. On the show, producer Watty White suggested Rayna and Deacon return to their early days with a scaled-down tour of smaller venues. Deacon’s band was playing at the Bluebird, where the set included “Matchbox Blues” (Lemon Jefferson), so Rayna joined him onstage for a song. Their touching duet of “No One Will Ever Love You,” (Steve McEwan, John Paul White) with the lyric “no one will ever love you like I do,” sent a crying Juliette running for the door. Members of the industry probably noticed Bluebird Cafe COO/GM Erika Wollam Nichols in the scene. See the recap of the pilot episode or visit ABC’s Nashville music lounge. If you have a scoop on Nashville, email sskates@musicrow.com.